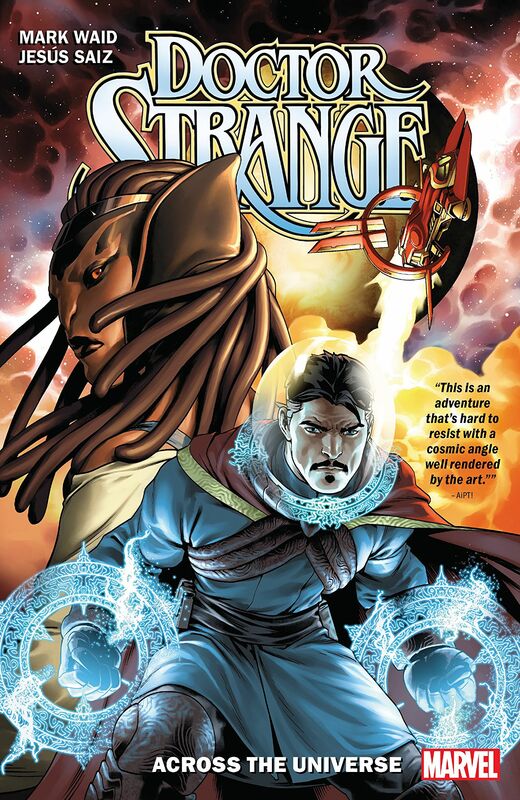 Doctor Strange: Across The Universe TPB Review – AiPT! Waid and Saiz’s Doctor Strange is a scintillating success. How do you reinvent or redefine a character as storied as Doctor Strange without undoing what seems like eons of character, and plot, development? Ask Mark Waid and Jesus Saiz, and like Donny Cates with Cosmic Ghost Rider alongside them, it seems they’re likely to say “space.” After reading their new take on our sorcerous surgeon, collected here in its first five cosmic and compelling issues, I can’t say they’re wrong. Earth’s Sorcerer Supreme goes intergalactic! When Stephen Strange loses his mastery of the mystic arts, Tony Stark offers a 21st-century solution: search for new magic in outer space! Bizarre new spells, allies and enemies await Strange beyond the stars, as he uncovers corners and secrets of the Marvel Universe never before witnessed! But he’s a little out of his element traveling the galaxy — and it shows! Okay, so a slightly braggadocious synopsis but maybe when Tony Stark of all people sets you down a path, that’s par for the course. The overall effect, however, is a fantastic, sleek way of setting Strange off kilter while still paying homage to the things that make him the man he has been (or may hope he can be again). Not only is he without power but he’s largely without a history or a context for anything or anyone he’s encountering — alone, and afraid, he can’t rely on power or intellect which he has for so long. There’s an undeniable thread of alienation coursing through the whole narrative (fitting that there’s actual aliens, too) and then of finding your footing again, of stumbling again and again but always getting back up that I was initially drawn to Strange for a long time ago, but that we rarely see in his stories like this. Back to the basics and exploring new stellar nooks and crannies of the Marvel world, the whole character and arc feels completely revitalized and reignited. Especially, when dwarves are going so far as to ask Strange why he never crafts his own damn weapons. Waid hones a furious and self-focused energy for the Doctor that feels off-putting and wrong (but totally right for this story), not unlike Stark, off-set by his fantastic and hilarious companion, Kanna. There’s a real tonal balance between the macro plotting and the micro characterization and developments that I grew to appreciate, adhere myself to and find real joy in, and by the collection’s end, I was eager to see where things go from here — not entirely sure that this Strange is all hero anymore, and fascinated by that concept alone. Less successful, though, is the anchor of a narrative technique: a quasi-third person take that constantly refers to Strange as “The Magician” and floats between omnipresent and focused in on Stephen’s feelings in a way that I found hard to follow, largely repeating the beats Saiz was hitting through pitch perfect visual storytelling, anyways. It’s not a complete and total failure, but it’s often grating and overly verbose in a way that detracts more than it adds. Which brings us to that visual storytelling, of course. Saiz is nothing short of a revelation. It could be because Strange is rendered so perfectly human against an alien, hostile space. It could be because worlds vibrant and arid are brought to life in equal measure. Or, it could be because the shading and coloring, in perfect harmony, add a weighty, flexible cinematic energy to everything. Better yet, it could be because all of these things and more work together. Whatever the reason, the ultimate outcome is a stunning, unique and cosmically compelling take on Marvel’s far flung worlds that feels both technologically, and magically competent in a very cool, realized way. Constant reboots and renumbering can be exhausting, let alone tracking down tie-in events and the like, but when all of that melts away into something so stunningly focused like this, it’s hard to not just step back and appreciate the experience. Doctor Strange is a success — here’s hoping he turns to the stars for assistance slightly more often. A new direction for a storied character that still gives a sleek credence to his huge history makes Waid and Saiz's Doctor Strange a success. He may read more like Stark than Stephen now, but that's part of the charm -- the journey here is truly compelling in macro and micro. The balance between Strange's more dry, sometimes sarcastic and serious wit and Kanna's endearing euphemisms and affable affectations is great balance and character work. Waid shines a light on aspects of a historic, seemingly untouchable character that I haven't thought about before: Why doesn't he make his own weapons after all? Saiz's worlds and characters alike feel real and lifelike, almost uncannily so but with a crackling cosmic energy and cinematic mood that lets both slower and more explosive moments shine equally. The narration is confusing and grating -- it's an interesting attempt but the voice isn't realized enough to be employed as often as it is. Infinity Warps #2 review: Wait, who is that?